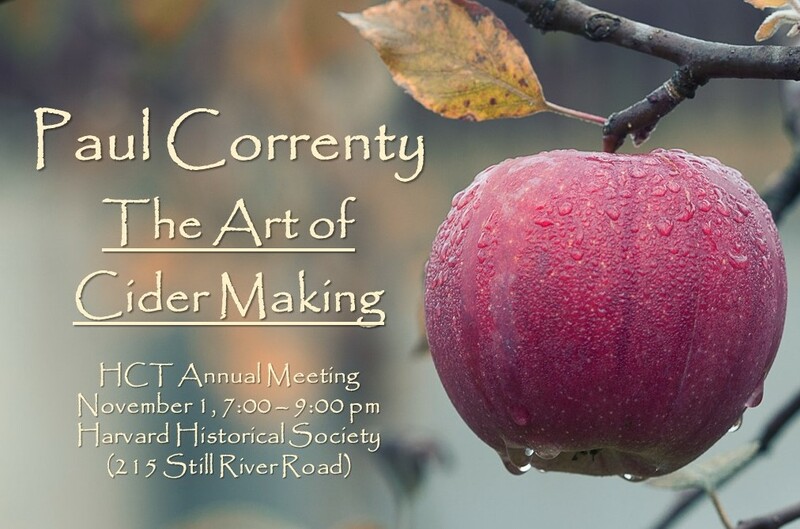 Celebrity chef and raconteur Paul Correnty, author of The Art of Cider Making and founder of the largest hard cider festival in North America will be the guest speaker at the Harvard Conservation Trust’s annual meeting on November 1, 2018. In his talk, Chef Paul will examine the history, the science, and the pleasures of hard cider, a beverage with deep roots in New England’s heritage. Along with enthusiasm, Chef Paul will bring an assortment of hard ciders for the audience to taste. The meeting will be held at the Harvard Historical Society on Still River Road. From 7 -7:30 pm, HCT business portion of the annual meeting with election of new trustees and at 7:30 pm Mr. Correnty will take the floor. https://harvardconservationtrust.org/wp-content/uploads/2018/10/fb_image_2.jpg 669 1012 David Outman https://harvardconservationtrust.org//wp-content/uploads/2016/08/HCT-Color-Logo.png David Outman2018-10-19 15:03:242018-10-19 20:03:47HCT Annual Meeting 11/1 - "The Art of Cider Making"